In statistical modeling, regression analysis is a statistical process for estimating the relationships among variables. It includes many techniques for modeling and analyzing several variables, when the focus is on the relationship between a dependent variable and one or more independent variables (or 'predictors'). More specifically, regression analysis helps one understand how the typical value of the dependent variable (or 'criterion variable') changes when any one of the independent variables is varied, while the other independent variables are held fixed. Most commonly, regression analysis estimates the conditional expectation of the dependent variable given the independent variables – that is, the average value of the dependent variable when the independent variables are fixed. Less commonly, the focus is on a quantile, or other location parameter of the conditional distribution of the dependent variable given the independent variables. In all cases, the estimation target is a function of the independent variables called the regression function. In regression analysis, it is also of interest to characterize the variation of the dependent variable around the regression function which can be described by a probability distribution. A related but distinct approach is necessary condition analysis (NCA), which estimates the maximum (rather than average) value of the dependent variable for a given value of the independent variable (ceiling line rather than central line) in order to identify what value of the independent variable is necessary but not sufficient for a given value of the dependent variable. Regression analysis is widely used for prediction and forecasting, where its use has substantial overlap with the field of machine learning. Regression analysis is also used to understand which among the independent variables are related to the dependent variable, and to explore the forms of these relationships. In restricted circumstances, regression analysis can be used to infer causal relationships between the independent and dependent variables. However this can lead to illusions or false relationships, so caution is advisable; for example, correlation does not imply causation. In a narrower sense, regression may refer specifically to the estimation of continuous response variables, as opposed to the discrete response variables used in classification. The case of a continuous output variable may be more specifically referred to as metric regression to distinguish it from related problems. In the 1950s and 1960s, economists used electromechanical desk calculators to calculate regressions. Before 1970, it sometimes took up to 24 hours to receive the result from one regression. A regression model relates Y to a function of X and β. The approximation is usually formalized as E(Y | X) = f(X, β). To carry out regression analysis, the form of the function f must be specified. Sometimes the form of this function is based on knowledge about the relationship between Y and X that does not rely on the data. If no such knowledge is available, a flexible or convenient form for f is chosen. If N data points of the form (Y, X) are observed, where N < k, most classical approaches to regression analysis cannot be performed: since the system of equations defining the regression model is underdetermined, there are not enough data to recover β. If exactly N = k data points are observed, and the function f is linear, the equations Y = f(X, β) can be solved exactly rather than approximately. This reduces to solving a set of N equations with N unknowns (the elements of β), which has a unique solution as long as the X are linearly independent. If f is nonlinear, a solution may not exist, or many solutions may exist. The most common situation is where N > k data points are observed. 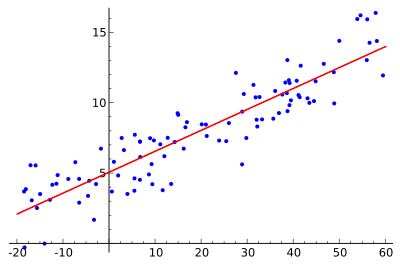 In this case, there is enough information in the data to estimate a unique value for β that best fits the data in some sense, and the regression model when applied to the data can be viewed as an overdetermined system in β. Finding a solution for unknown parameters β that will, for example, minimize the distance between the measured and predicted values of the dependent variable Y (also known as method of least squares). Under certain statistical assumptions, the regression analysis uses the surplus of information to provide statistical information about the unknown parameters β and predicted values of the dependent variable Y. Consider a regression model which has three unknown parameters, β0, β1, and β2. Suppose an experimenter performs 10 measurements all at exactly the same value of independent variable vector X (which contains the independent variables X1, X2, and X3). In this case, regression analysis fails to give a unique set of estimated values for the three unknown parameters; the experimenter did not provide enough information. The best one can do is to estimate the average value and the standard deviation of the dependent variable Y. Similarly, measuring at two different values of X would give enough data for a regression with two unknowns, but not for three or more unknowns. If the experimenter had performed measurements at three different values of the independent variable vector X, then regression analysis would provide a unique set of estimates for the three unknown parameters in β. In the case of general linear regression, the above statement is equivalent to the requirement that the matrix XTX is invertible. 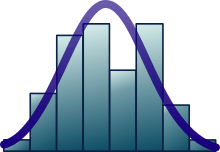 When the number of measurements, N, is larger than the number of unknown parameters, k, and the measurement errors εi are normally distributed then the excess of information contained in (N − k) measurements is used to make statistical predictions about the unknown parameters. This excess of information is referred to as the degrees of freedom of the regression. Assumptions include the geometrical support of the variables. Independent and dependent variables often refer to values measured at point locations. There may be spatial trends and spatial autocorrelation in the variables that violate statistical assumptions of regression. Geographic weighted regression is one technique to deal with such data. Also, variables may include values aggregated by areas. With aggregated data the modifiable areal unit problem can cause extreme variation in regression parameters. When analyzing data aggregated by political boundaries, postal codes or census areas results may be very distinct with a different choice of units. This is called the mean square error (MSE) of the regression. The denominator is the sample size reduced by the number of model parameters estimated from the same data, (n-p) for p regressors or (n-p-1) if an intercept is used. In this case, p=1 so the denominator is n-2. where xij is the ith observation on the jth independent variable. If the first independent variable takes the value 1 for all i, xi1 = 1, then is called the regression intercept. The phrase "limited dependent" is used in econometric statistics for categorical and constrained variables. The response variable may be non-continuous ("limited" to lie on some subset of the real line). For binary (zero or one) variables, if analysis proceeds with least-squares linear regression, the model is called the linear probability model. Nonlinear models for binary dependent variables include the probit and logit model. The multivariate probit model is a standard method of estimating a joint relationship between several binary dependent variables and some independent variables. For categorical variables with more than two values there is the multinomial logit. For ordinal variables with more than two values, there are the ordered logit and ordered probit models. Censored regression models may be used when the dependent variable is only sometimes observed, and Heckman correction type models may be used when the sample is not randomly selected from the population of interest. An alternative to such procedures is linear regression based on polychoric correlation (or polyserial correlations) between the categorical variables. Such procedures differ in the assumptions made about the distribution of the variables in the population. If the variable is positive with low values and represents the repetition of the occurrence of an event, then count models like the Poisson regression or the negative binomial model may be used instead. However, this does not cover the full set of modelling errors that may be being made: in particular, the assumption of a particular form for the relation between Y and X. A properly conducted regression analysis will include an assessment of how well the assumed form is matched by the observed data, but it can only do so within the range of values of the independent variables actually available. This means that any extrapolation is particularly reliant on the assumptions being made about the structural form of the regression relationship. Best-practice advice here is that a linear-in-variables and linear-in-parameters relationship should not be chosen simply for computational convenience, but that all available knowledge should be deployed in constructing a regression model. If this knowledge includes the fact that the dependent variable cannot go outside a certain range of values, this can be made use of in selecting the model – even if the observed dataset has no values particularly near such bounds. The implications of this step of choosing an appropriate functional form for the regression can be great when extrapolation is considered. At a minimum, it can ensure that any extrapolation arising from a fitted model is "realistic" (or in accord with what is known). ↑ Armstrong, J. Scott (2012). "Illusions in Regression Analysis". International Journal of Forecasting (forthcoming). 28 (3): 689. doi:10.1016/j.ijforecast.2012.02.001. ↑ Christopher M. Bishop (2006). Pattern Recognition and Machine Learning. Springer. p. 3. Cases [...] in which the aim is to assign each input vector to one of a finite number of discrete categories, are called classification problems. If the desired output consists of one or more continuous variables, then the task is called regression. ↑ Yule, G. Udny (1897). "On the Theory of Correlation". Journal of the Royal Statistical Society. Blackwell Publishing. 60 (4): 812–54. doi:10.2307/2979746. JSTOR 2979746. ↑ Aldrich, John (2005). "Fisher and Regression". Statistical Science. 20 (4): 401–417. doi:10.1214/088342305000000331. JSTOR 20061201. ↑ N. Cressie (1996) Change of Support and the Modiable Areal Unit Problem. Geographical Systems 3:159–180. ↑ Tofallis, C. (2009). "Least Squares Percentage Regression". Journal of Modern Applied Statistical Methods. 7: 526–534. doi:10.2139/ssrn.1406472. ↑ YangJing Long (2009). "Human age estimation by metric learning for regression problems" (PDF). Proc. International Conference on Computer Analysis of Images and Patterns: 74–82.